The recalled children's toys can unexpectedly tip over during play, posing an entrapment hazard to young children. Guidecraft has received two reports of tip-over incidents, including one report of a child who suffered minor contusions and abrasions. This recall involves about 1,800 play theaters sold in the United States and 350 in Canada. All 4-in-1 dramatic play theaters with model number G51062 are included in the recall. The model number is printed on a sticker affixed to the bottom of the center crossbar and on the assembly instructions. 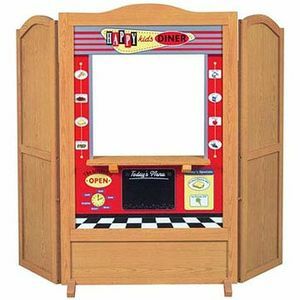 The toy has two interchangeable panels with different themes on each side: a puppet theater and diner, or a doctor's office and post office. An assembled play theater measures 4-feet high by 3-feet wide and weighs about 46 pounds. Various catalogs, Guidecraft.com, and other Internet retailers nationwide from July 2010 through April 2011 for about $180. Immediately take the recalled product from children and contact Guidecraft to receive a refund or a replacement product. For additional information, contact Guidecraft toll-free at (888) 824-1308 between 9 a.m. and 4:30 p.m. CT Monday through Friday, or visit the firm's website at www.guidecraft.com.